On Sunday, September 15, 2013, Raceway Park ran its final card. Horse racing in Toledo, which goes back to places like Fort Miami in Maumee and even beyond that, is now but a memory. The Blade covered the closing of this Toledo institution pretty well: a day-of story, a story about the thousand or so die-hards who showed up for the final card, a photo gallery. The owners, Penn National Gaming, took their racing license to Dayton to build a new track there. The first meet ran all of October, 1959. Horse racing tracks are up against it, and have been for a long time. When they were the only game in town, times were great. Then state lotteries showed up. Then, casinos. Then, online gambling. When I last set foot in Raceway Park in 2004, it was a shadow of its former self. It was December, so there was no live racing, but there were still a few people shuffling around watching and betting on out-of-state races on televisions. It was not how I remembered the place at all: big crowds under the lights on summer nights watching the Standardbreds race around the track. The sights and sounds of a race track can be pretty intoxicating to a little kid – the cigar smoke, the mess of discarded tickets, and how they’d play the Colonel Bogey March before the horses reached the starting line (never did figure that one out). Raceway Park was founded by brothers Stanley and Sylvester “Shake” Jechura in 1949 as an auto racing track. Stanley got into the sports promoting business while operating a tavern on Nebraska Ave., and began promoting stock car racing at Fort Miami Race Track. The brothers converted it to a horse racing plant (at a cost of $1.5 million) and opened for business October 5, 1959. Stanley died Aug, 6, 1962 at age 49 when the Cessna he was piloting crashed near Fenton, Michigan (story link). Opening Day coverage from October 6, 1959. Click to read. So Sylvester, along with his brother, Chester, assumed operation of the track and were the face of the operation for a long time. 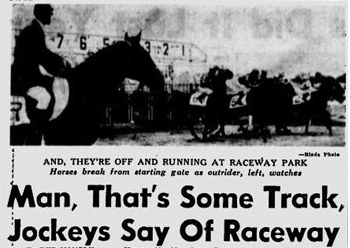 In 1962 harness racing was added and three years later the track was expanded from 1/2-mile to 5/8-mile. Fires are always a large threat at racetracks and Raceway Park was no exception. The first serious blaze was on August 28, 1976 (link) when four barns burned, killing 40 horses and causing $250,000 in damage. 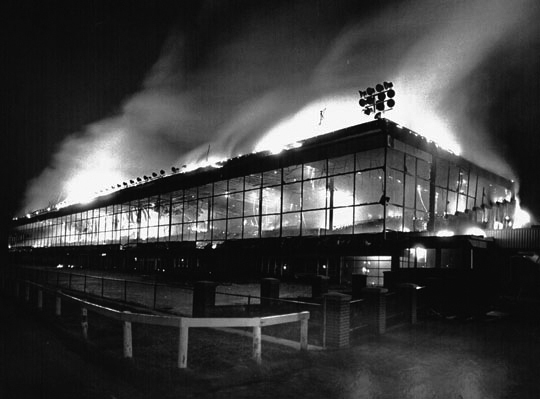 A more serious fire (for which there is no link, sadly) was on May 1, 1977, when the grandstand and clubhouse burned down. It reopened April 20, 1978 to a record crowd of 6,936 who pushed $311,796 through the windows. Jechura sold the race track and moved to Florida in 1988. He died in 2009 (link to obituary via legacy.com). A 1952 ad. Non-Ford Nite! But with the many options gamblers have these days, horse racing is no longer the only game in town. Pulling a handle on a slot machines is a lot easier than figuring out how this $5,000 claimer who has the rail and early speed will fare while he’s dropping in class. Much easier. 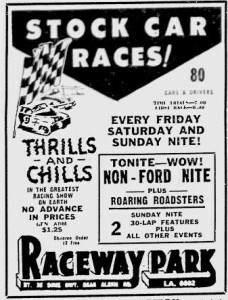 In 2011, Raceway Park had 52 racing dates, all on Saturday and Sunday nights. In 2013 it had 42 dates. That’s compared to 111 nights in 1976. Blade sports columnist Dave Hackenberg wrote about the closing, but didn’t go, because the Raceway Park he remembered – the one I remembered as well – was long gone. 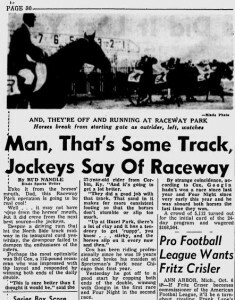 Hackenberg, who wrote the 1978 reopening story linked above, also remembered Raceway Park as fondly as I do – if not more – in this 2011 story. I wish I could have been there. I wanted to take a moment and thank you for the posts and kind words about Raceway Park. My grandfather, Sylvester “Shake” Jechura took great pride in that race track at 5700 Telegraph Road. I am the only one of his five grandchildren that had the pleasure and honor of working for him at the track. I can look back on it and say that now. One of my earliest memories of of the track is from when they use to have the circus in the parking lot. Long beofore it moved to the Sports Areana and was still a true Big Top. I remember my grandfather had to put me on his shoulders so I would not accidentally walk into elephant dropping. I can still remember how the elephants left big holes in the asphalt where ever they walked. I could go on for hours with stories about Raceway and my grandfather. I believe a site like this is so very important to preserve what has come before us. I think I have a unique perspective on Toledo as my grandfather and his brothers built one of Toledo’s most successful businesses. Then you have my father Danny Wilson, started as a regular guy in the body shop at Jeep and went on to become UAW Local 12 President. Toledo history is important and what you are doing is a wonder thing. Such a nice tribute, Dion. It’s hard to believe they are all gone, even your mother. Carl and I were at your parents’ wedding, and came to Shakes house the Thanksgiving after you were born. It was either at Xmas or T’giving time. I also appreciate your attending Jerome’s funeral in Toledo. We needed family support during that time. Carl is in contact with a few of his cousins that are his age, and they are all doing well as retired folks! My best to you and your family. My husband, Carl Jechura, son of the oldest of the six Jechura brothers, has many fond memories of the ‘track’. Although his father, Karl, did not have any financial interest in the business, his family spent many days there just to be with his brothers and many nieces and nephews and their families. Carl recalls his uncles in the very early days allowing him and a couple of the cousins to go around the track in the early 50’s to pick up car parts that were lost during the races. There were monthly visits to the horse track. They were all a very tight group and I remember many weddings and holiday gatherings. There was always much laughter, eating, drinking, and Polka dancing at these affairs! The four sisters and husbands all worked at the track part-time at the entrances collecting tickets, office duties, etc. They were all very hard workers, not afraid to get their hands dirty, and played just as hard. I miss them all. I am doing research trying to find my roots. My grandfather was Chester’s son Ralph. I never knew him as we were estranged. I have been going through a deeply spiritual journey the past two years and trying to find out as much as I can about my biological family. I don’t know who to contact but I feel so honored to be a part of such a great legacy. Hi I can help. Chet was my uncle and and my dad’s bother. I spent a lot of time with Uncle Chet over many years he was one of my favorite uncles and is buried near my dad and other Jechura’s including their parents Mary and Felix . I also knew Ralph well too, we were in contact until his accident. Lots of Jechura story’s and history. I miss Stan, died at 54 and his mom died one month later, I think of them a lot! We probably sat at the same table at one of the many family polish weddings or party’s years ago. I am the son of Tony and Diane Jechura. My dad Tony was Karl’s bother. Trying to remember but I think the last time I saw Uncle Karl was in the early 80’s, he would call me Stefan all the time ( my dad’s real name). Anyhow thought I would say Hi. I was searching for old car racing programs where the Jechura’s started and my dad was an official and ran across this site.